We are just a day away from the Phillies and the Mets in the second Little League Classic, played this year in Williamsport, PA. Williamsport is a logical venue choice considering the small Pennsylvania city hosts the Little League World Series each year. 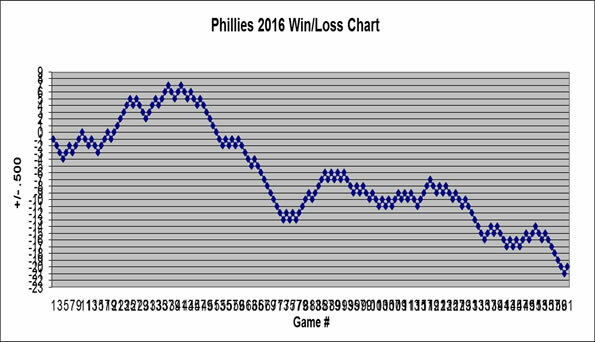 It also makes sense for the Phils to take the field as the home team for the matchup considering the Williamsport Crosscutters are the Class A Short Season Affiliate of the Phillies. This type of event doesn’t simply “happen.” Preparing the field for a nationally televised prime-time contest takes more than a few cans of paint for the MLB logo. Here's a look into what it takes to make a minor league park big league ready. Sports Turf Managers Association (STMA) – comprised of more than 2,700 professionals overseeing sports fields worldwide celebrates its members for their preparation and maintenance of BB&T Ballpark at Historic Bowman Field in Williamsport, PA. in anticipation of the second Major League Baseball (MLB) Little League Classic. BrightView, the nation’s leading landscape services company and a sports turf consultant to Major League Baseball, employs STMA members responsible for the field preparation at Historic Bowman Field. Beginning Aug. 13, BrightView’s Development and Sports Turf teams will prepare the field by putting down new conditioner products on the infield skin, painting logos, perfecting edges in the infield and warning track and ensuring the home plate area and pitcher’s mound are at major league standards. Additionally, the team will add padding to the outfield walls, field lights, tents, and trailers for operations and train the Penn College Baseball team on tarp deployment. The second oldest and most distinguished Minor League Baseball venue in the country will play host to the Mets and Phillies tomorrow on ESPN, with the first pitch slated for 7:10. "We were thrilled when MLB announced there would be a second Little League Classic considering the fantastic job our members and BrightView did rebuilding Historic Bowman Field last year," says Kim Heck, CAE, CEO of STMA. “This game is not only great for the community in Williamsport, but it’s an honor for our members to showcase their excellent work creating the safest and most aesthetically pleasing playing surface possible." Last year, BrightView Landscape Development and Sports Turf teams laid 4,500 tons of sand and root-zone material to prepare the natural grass surface; removed 1 1/2 feet of physical mass; constructed the playing surface and set infield and outfield sod the week of May 30, 2017. BrightView also oversaw the installation of new foul poles, bullpens, a batter’s eye and backstop net to meet MLB requirements. The new ballfield was opened June 20, 2017. What are some of the challenges that come from hosting an MLB game at such a small venue? The city of Williamsport has a history of pulling off major events, such as the Little League World Series. With a project like this game, there are a lot of moving parts required to make a small ballpark become a Big League park. The MLB has put together a great team consisting of BaAM, populous, and BrightView, and tasked us to create a Major League experience for the Little League World Series kids and their families. A couple of weeks before the game, all the upgrading of the overall ballpark begins. This includes adding the typical media amenities for an MLB game and production requirements, as well as team facilities. What does an MLB field require that a Minor League field, such as that of the Crosscutters, does not have? We replaced the entire field last year with one that met MLB playing standards and their grading and drainage requirements. The field is also home to the minor league Williamsport Crosscutters and Penn College baseball teams. 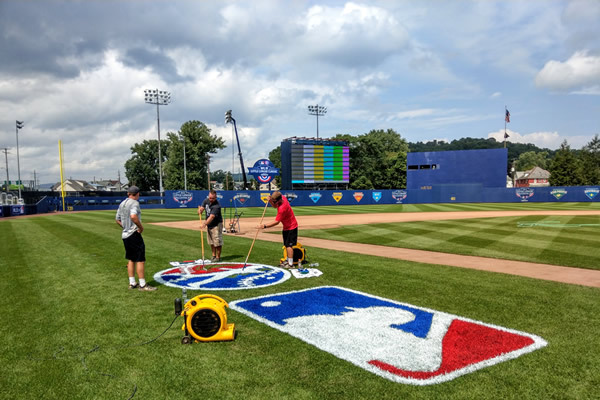 Keeping it in top condition during those two seasons while also planning for the MLB Little League Classic event is done through a lot of teamwork and a top-notch ground crew. What exactly needs to happen in the next week to get the stadium ready for the Little League Classic? The list is long, but some of the larger items include adding pads to the walls, rebuilding the mounds and home plate, building an 40-foot-by-80-foot wide batters eye, building the production compound and additional locker room amenities, adding a video board system, and upgrading the field lights with Musco’s portable lighting system. Then all of that work comes down in a matter of days to welcome the Crosscutters back for the remaining part of their season.